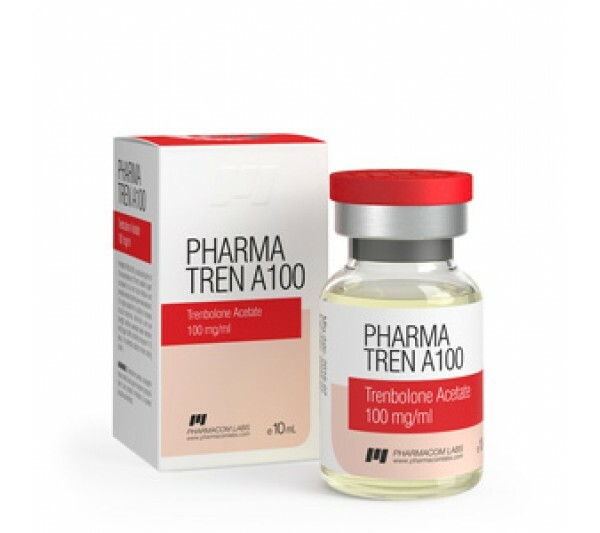 Pharmacom Pharma TREN A100 - Trenbolone Acetate is a powerful steroid used to build muscle, increase strength and burn subcutaneous fat. The most popular form of the drug is Trenbolone Acetate, which has the lowest half-life. However, due to the high frequency of injections, he did not receive due popularity among newcomers. The drug has no estrogenic activity and does not contribute to the accumulation of excess fluid. With solo reception it makes it easy to gain up to ten kg, while the time it is detected on doping control is quite long - up to 5 months. Features Trenbolone can also be called an increase in libido, appetite and production of testosterone. Trenbolone acetate is usually administered daily by 50 mg each day or 100 mg every other day. This is an injection form, the course of which should not exceed 4 weeks. In tablets, the drug is taken every day for 200-300 mg. Combining with Winstrol helps to achieve more intense muscle drying and does not require the use of anti-estrogen drugs. In any case, the reception should be started with the minimum doses and increased gradually, following the reaction of the body. In the event of adverse effects, the drug can be canceled without risk to health. Trenbolone is not recommended for adolescents and women athletes, due to the high risk of virilization. In addition, he has contraindications in the form of breast cancer and sensitivity to the components in the composition. When dosages are exceeded, manifestations occur in the form of excessive aggressiveness, increased pressure, tendency to excessive sebum production and acne. In rare cases, the drug can reduce the production of testosterone, which, in turn, hello to the problems of the urinary system. In general, it is recommended to continue the course of gaining muscle mass, and in the initial stages it is better to choose other steroids, the anabolic effects of which are less pronounced. In our store you can buy Pharma Tren A100 and other steroids at the best prices in Australia.